It is all Kraft with papers from the Tim Holtz Kraft resist stack and I’ve used some Antique Linen Distress Paint for the background. I particularly love the way that the Gathered Twigs Distress Stain gives the Kraft Resist a look of suede. Would you believe that I still have not run out of samples from the show? Sorry! There are still more to come! Don’t forget my Cricut giveaway! Previous postHow Do You Read And Follow Your Favourite Blogs? Oh I think this is stunning and although not my style can appreciate and would love to beable to make these. I just make them look flat and lifeless. My Dad would love this as a fathers Day card. Unfortunately I missed your last shows so I'm looking forward to seeing more samples in your blog. This is absolutely stunning, love the simple layout and gorgeous details. 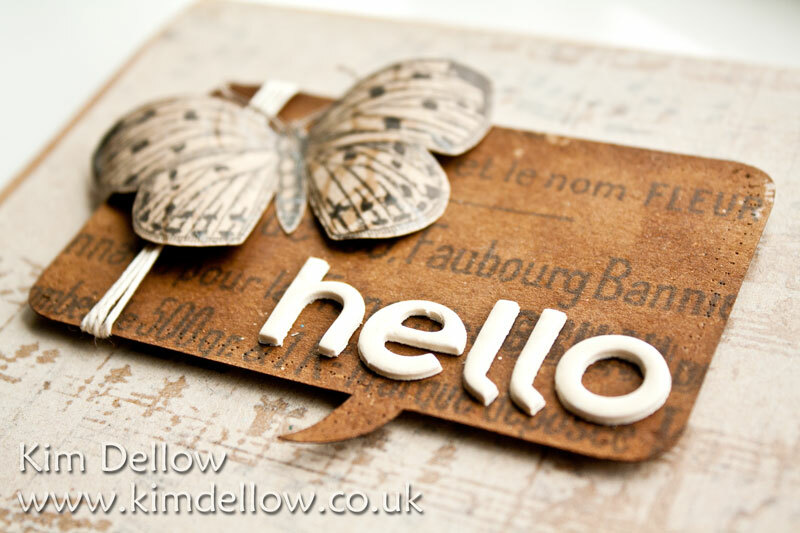 Gorgeous card Kim – love the vintage feel to it. Ooh! Kim, this is so gorgeous. Love the beautiful butterfly. hi Kim this is stunning,it has just a very different look,thanks fro the inspiration. What a fab card Kim. I love the natural colours. It's so pretty, and the ink on the kraft resist really does have a suede-y look. Keep'em coming… mp meed for apologies at all! Kim, this is a beautiful card. I love the simple perfection and the 3d butterfly. Lovely card – the sort of card you can send to anybody for any occasion. Terrific sample, just love the suede look you created. Absolutely Beautiful, I just love the fact that it could be used for anyone. Who doesn't love a card with a beautiful butterfly on it. How did you do the letters? This is so pretty and love the earthtone color palette you've used. Great card!! Absolutely beautiful Kim. Love the colours.